Tent camping is an amazing family activity! Fresh air! Explorations! Cooking over fire! Dirt, sticks & rocks!!! But it’s an activity that also takes a little practice to get perfect. 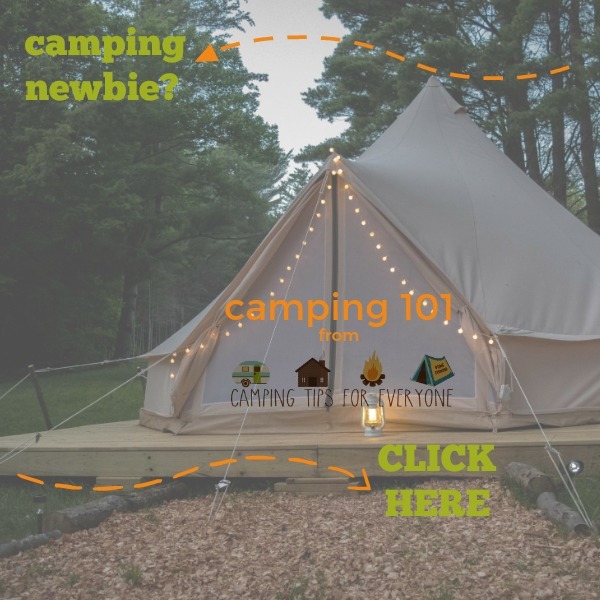 We’ve been camping quite a bit and these 5 family camping tips will help you make your first camping adventures less hassle – and maybe make camping your favorite vacation getaway! These tips assume you have already booked your campsite and you have purchased or borrowed a tent. My luggage of choice for any tent camping trip is a bunch of sturdy Rubbermaid -type containers. The reasons are simple: 1) They hold a lot. 2) They are waterproof if correctly sealed. 3) Most critters can’t get into them. 4) They stack nicely. 5) You really don’t want to drag your luggage around a campsite. I am also a huge fan of Space Bags . While I love the large ones that require a vacuum to remove the air, I am equally enamored with the ones that you roll the air out of. Not only does this allow me to get large, bulky items into my containers, but it also helps me keep clean and dirty (or wet) items separated. Use a handy tote to haul towels, toiletries, and other necessary items to the showers. Sleeping on the ground is only fun if you are a child. And even then you should add padding under the sleeping bag! So you’re gonna “rough it” and sleep on the ground. A word of advice: that’s only fun if your under 12. Invest in an inflatable mattress . Make sure it has an air pump of some sort- you don’t want to be stuck blowing it up manually! You can find air mattresses that take batteries, but that is expensive. If I don’t have electricity at my campsite I make sure to have a DC adapter in my car. 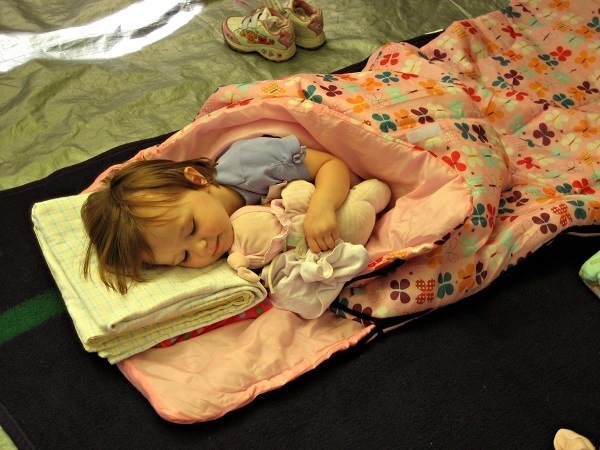 In addition to the mattress you will want to bring more blankets than you think you’ll need. It gets cold at night. And you’ll wake up a bit clammy and chilly. Bring a blanket to go under your air mattress to protect it from anything on the ground that might puncture it, another to go on top of the air mattress (below the sheet) as that plastic gets cold at night, and a nice thick one to cover your self with. Yes, that is three blankets per bed. Trust me, you’ll want them. If you have kids who still take naps- or if you just want them to relax for a while in the afternoon- try to get a campsite with electricity and bring a fan. Tents can get very hot and muggy in the afternoon; the tiniest bit of sunlight shining on your tent will raise the heat to sauna levels. Trust me- I’ve done it both ways and the fan is a life saver. 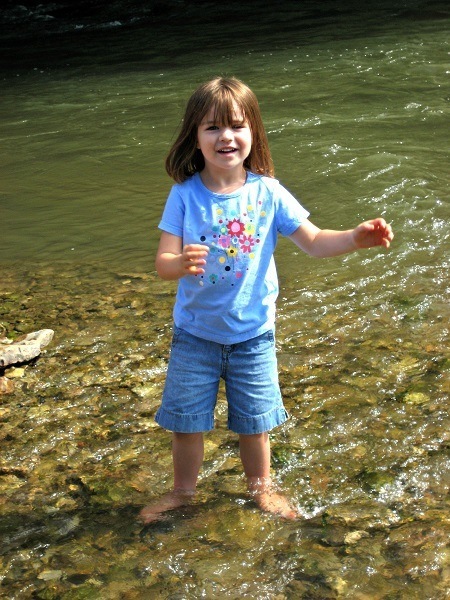 Streams, dirt, and sticks are part of the joy of camping! Bring plenty of clean clothes! When camping with kids plan to use 2 pair of clothes per day per kid. If you don’t use them, great. But my kids play in streams, sand and dirt when we camp. It’s nice to have them clean-ish. Bring warm pajamas and socks. If you plan to hike remember jeans, long sleeve shirts, sturdy shoes and a hat. Save yourself as much as possible from scratches, ticks and other creepy crawlies that live in the forest. And don’t forget a First Aid Kit (ours has a snake bite kit in it- just in case). You can’t go camping an not make s’mores! When tent camping I apply the KISS rule. Keep It Simple Stupid. No one is expecting a gourmet meal. Keep to easy to grill foods: hot dogs, brats, burgers, veggies, chips, potatoes, marshmallows. Want to try your hand at campfire cooking? Follow my Camping Food board on Pinterest! Chili fries in foil- so easy and tasty! Spray foil with cooking spray, add frozen french fries, chili beans, and cheese. Seal tightly! Cook over fire or in hot ashes. If you’re cooking over fire you need cast iron cookware . Make sure it’s “seasoned” before you use it. The great thing about cast iron is that you don’t wash it. Just scrape it out, maybe cook out any thing left in it, and it’s ready to use again. (Bring oil for cooking- it will keep the cast iron seasoned and keep food from sticking.) Tip: if you don’t want to buy an entire set of cast iron, at least invest in a good Dutch Oven with legs. This is the single piece of cast iron every camper needs! Another great way to cook over fire is in foil. Just wrap your meat, veggies, chopped potatoes, and a few drops of water in the foil. You can cook over the flames or bury it in the hot coals to cook. You can also bake a potato this way. And corn on the cob. Don’t forget dish soap and a rag or two- you will have a few things to wash- and use one of the Rubbermaid containers as a wash tub. Those are my Top 5 Family Camping Tips for New Campers. If you have a handy tip for camping please share it in the comments. I would love to hear them!